What Does the Term “Useful Idiot” Mean? “Useful Idiot” is a political insult that describes a person who, through manipulation or not, is useful to a political cause that is not their own despite not fully realizing their role. This makes them “an idiot,” an unwitting and useful pawn of a propagandist. This broad concept can apply to a vast range of situations, as it involves little more than a person’s actions furthering a political cause whose true intentions they aren’t fully aware of. For example, if an interest sought to divide a people and promote their own ideology, anyone who caused division or promoted that ideology, by any means, could be cynically called a “useful idiot.” If one furthers an agenda that is not there own, whatever it is and in any way, and thus does another’s work for them without realizing it (essentially acting as a propagandist unwittingly), the insult “useful idiot” can be used to describe them. Sit with another world leader not realizing it was a photo op, offer a compliment to a country that isn’t your own not realizing it will be used as a sound bite, post something divisive on social media not realizing that play’s into another’s strategy, or slander someone else’s political opponent (thus doing their job for them)… and you could be considered a sort of useful idiot of sorts. If you are being useful to a cause that isn’t fully your own, and you aren’t fully aware of it, then the term generally applies. Innocent or idiot aside, doing the other team’s dirty work for them because you can’t check your own ego can be a real problem. Of course, being a useful idiot isn’t something that can only happen to a right-winger with an ego, it can happen to anyone left, right, or center. When leftists praise Communist and Socialist governments that rule by military might, when a right-winger praises right-wing military strong men of foreign countries, when an actor goes to the country of a dictator to show that the country really isn’t that bad, when a citizens backs a political narrative emotionally when it was really just a half truth (or worse, literally “fake news“), all these are examples of useful idiocy that help show that anyone of any ideology can fall victim too. The problem here is that this trap is very easy to fall victim too. Consider, one can be put in a position where one or more of their actions will result in playing into the hand of more than one other persons, and sometimes those actions are as mundane as accepting an invitation to dinner (see the image below)! NOTE: With the above in mind, consider that the people (both left and right wingers mind you) in the following image could be completely “innocent,” but could have had their ego used against them to bring them to the photo op, never having wittingly done anything wrong. Yet, the end result is, a rather damning photo op, that can then be used as propaganda. Since the actors were unwitting, and the result was propaganda for a cause that wasn’t specifically their own, the term “useful idiot” applies. Mikhail Klimentyev / Sputnik, Kremlin Pool Photo via AP, file. Captions from NBC; for educational purposes only. In other words, it is a rude term meant to poke fun of and denote a person who is easy to manipulate, or just obliviously acting as a propagandist for a cause that isn’t their own (be they fully unaware of their participation or be they duped into acting as a sympathetic “fellow traveller”). This rather elusive term, whose origin story is as hard to pin down as a perfect definition (it is generally thought to be from soviet era Russia used to make fun of unwitting Communist sympathizers), can be used to describe a person who spreads propaganda about a group, or just a person who is being exploited by the group. That makes things complex, but it doesn’t change the rules of the game. This is to say, one’s self interest may be very close to the interests of another, but that doesn’t stop the term from applying. It rarher points out why we must be so cautious not only with any divisive message and insidiously also without positive ones that praise anyone but our closest allies. Suffice to say, the term implies a few things, but in general: If a person is politically useful to a cause that isn’t their own, and they don’t fully know it, they can be said to be “a useful idiot” for that cause. No one wants to be an idiot, thus one must learn to check themselves and think critically (not emotionally). TIP: For examples of useful idiots see rational wiki. If consider Dennis Rodman going to North Korea, Edward Snowden leaking classified documents, Julian Assange spreading state sponsored hacks, right-wingers praising militant right-wing leaders, progressives praising militant left-wing leaders, etc as examples of people being useful idiots. And if we see messages like “you can’t trust the news,” all liberals want to take your guns, right-wingers don’t care about the poor, etc as the propaganda useful idiots spread, then we get the idea behind this insult. You don’t have to agree that Snowden (for example) acted as a useful idiot, you just have to understand the concept. We all want our guys to be right, we want Wallace and Debs to have always been right on the left, we want Fox News and Trump to be on-point on the right… but the reality is, especially when we are politically divided, it is easy to act as useful idiots if we don’t check our egos and emotions and think carefully about the effects of our words and actions. TIP: Although anyone can be a useful idiot accidentally, and anyone can be manipulated, the prime target of those looking to manipulate useful idiots isn’t just anyone in general. The primary target is specifically those who think they are very intelligent and those who are very responsive to praise (see the informative video below). So a key political figure, activist, actor, or professor fits this bill. Their words have reach, and their ego allows for them to be manipulated. Useful Idiots. A radio show by the BBC on Useful Idiots. The audio content here is very useful, the images make it seem like only leftists can be useful idiots… which is itself a type of propaganda. Meaning, the audio content of this video is amazingly useful, and the video content (which someone else did) is dipping a toe into being usefully idiotic. IMPORTANT THIS ISN’T A LEFT-RIGHT ISSUE (EVERYONE NEEDS TO CHECK THEMSELVES): With the above in mind, there is this pervasive idea that only leftists can be useful idiots (perhaps as they were the targets of LEFTIST SOVIET Russia. What, were they going to indoctrinate a right-winger? No, not in those days, generally speaking; but today…). Thinking that only leftists can be useful idiots though is, and sorry to get meta, likely part of a social influence campaign meant to turn people against leftists and blind people to the equal and opposite problem on the right-wing. No person, left, right, or center is beyond getting duped (and there is nothing more dangerous than thinking you can’t be duped, those who think they can’t be duped are the most useful to dupe, as they will never admit they have been fooled!) Each type has their own Achilles heels, their own bias and emotion to exploit. If we turn leftists against the right-wing, and right-wingers against leftists, then we have used both as “unwitting pawns” in our social influence campaign. Don’t get duped like that. If you are going to write about this topic, present both sides of the story and help prime people against being indoctrinated. If you are going to make this about “feminism” realize there is a right-wing strategy that has tried to indoctrinate you into this (this isn’t to say that thought can’t be your own, but it is to say I can describe the strategy that wants people to think that), I call it the Sixth Party Strategy. With the above noted, let’s discuss the term useful idiot in a few different contexts. The term, often used in its plural form “useful idiots” (and sometimes used more politely as “useful innocents”; for instance by Mises), was originally said to be used to describe Soviet sympathizers in Western countries (although the true roots of the term, while likely Russian, seem even more elusive than that; see here for example). Specific roots of the term aside, the concept is the Soviet sympathizers were useful in destabilizing governments and setting the stage for Communist revolutions, but weren’t always very useful afterwords (as people tend to do an ideological 180 when they realize they have used as a pawn; see change, adaptation, and resistance). So, imagine people (citizens or public figures) in one country unwittingly spreading disinformation and talking points that are beneficial to another country. Like, what if some were tearing each other apart over dossiers and emails leaked by plausibly deniable sources, while talking about how awesome Putin looked riding a horse? Then, what if we not only had to deal with slanted reporting on it from our own state media, but what if Russian State TV was also spinning its own narrative, and meanwhile people online from the far-left, far-right, and center were all playing part in many different narratives which were all accomplishing some goal that was not anyones actual intention? Then, on-top of that, imagine well intentioned people were trying to tell you about the reality of useful idiots and were getting drown out by the noise. “Oh, dear, that sounds confusing!,” and you are right, it is… which is partly the point. The point being subversion techniques meant to manipulate public opinion for ideological ends aren’t meant to be clear cut and binary, they are meant to bypass defenses and prey on emotion. Oh Dearism. Some more “Russian intelligence” tactics. When in doubt, one should typically err toward the country they live in. Actually, when in doubt a person should fact-check earnestly. When you think you know and close your mind to skepticism and debate, you take a slippery step toward being dangerously wrong. Dark Russian roots and present day applicability aside, the term is way more useful to understand in a broader and more general sense than in its dark cynical sense. In a broad sense, useful idiot simply describes anyone who furthers any agenda of any group without fully realizing the details of what they are doing, regardless of whether that group had any involvement in influencing them (directly or indirectly). Here it really doesn’t even have to be political, but we will keep with the political examples for a moment. If I watch a good clip on X News, pick up a talking point, then read it off to my friend who watches Y News, I’m being a useful idiot for X News. I’m playing public relations on behalf of a team, and i’m not aware of it, so i’m being “a useful (to them) idiot (unaware of my role)”. Maybe I’ve been duped, as the “idiot” aspect implies, but maybe it is even more mundane than this… and maybe I know full well what I am doing and I’m only being perceived as being a useful idiot (keep in mind, the term is generally an insult more than an identity). Still, complexities aside, the term and the logic behind it applies. The idea here is that “the idiot” is spreading counterfeit information, mixed with truths, half-truths, emotions, boring factoids, sensationalism, and general confusion, and not spreading pure unbiased information with differing viewpoints noted, and with their own interests and the interests of others considered (and thus is offering up fodder for the propaganda of others). Specifically, whatever else happens aside, the term applies best when the idiot is useful in spreading talking points that benefit an ideological group, rather than spreading information that benefits the recipients of the information (AKA the point is propaganda). Suffice to say, when a person passes along propaganda that is useful to a group, but they aren’t fully aware of the implications of what they are doing, they are being a useful idiot for the group. When the person has been groomed for this, then they are fully embodying the concept of “useful idiot”, but even more mundane and less detectable actions shouldn’t be excluded from a broad and general definition of the term. If anything it is a term that reminds us to be careful of the message we are spreading and who could be benefiting form that message. Examples: Being a useful idiot can be something simple and mundane like unwittingly spreading the talking point of the day, or it can be something more impactful like Jane Fonda’s controversial visit to Hanoi or the time TIME featured Hitler as the man of the year… in 1938 (consider Hitler came to power in 1933). That said, this gets complex. What about a well-intentioned American like the Socialist Debs?… again though, part of the point of social tactics like this is that a tactician’s best friend is complexity. It is the public, not the spinster, who is endangered by the muddled mind games. All this to say, the concept is nuanced; But it is just as well… as avoiding being a useful idiot requires critical thinking. Some ideas are so stupid that only an intellectual could believe them. – Attributed to George Orwell (although there is no evidence he said this, which is ironic and complex and thus fits well on this page). TIP: Russia is a large nation with many different types of people and many differing political factions. It would be crazily biased to be anti-Russia, and certainly we aren’t trying to portray a bias against Russia (or any other entity). We are trying to use examples prevalent to how the term applied in the past and applies today, to what degree an entity is a good example shouldn’t be construed as a bias for or against. TIP: Idiot in this case just means “not fully aware”. Ideology means “belief system” (here generally referring to political ideology). Propaganda is a means through which ideology is spread (typically by focusing on spreading an emotion rather than pure fact). None of these are “happy” words, but if we want to understand history [or even current politics], and avoid being a useful idiot for a cause that is not our own, we have to deal with these terms anyway. NOTE: I strongly support giving blood. The meme on this page is meant to be humorous. 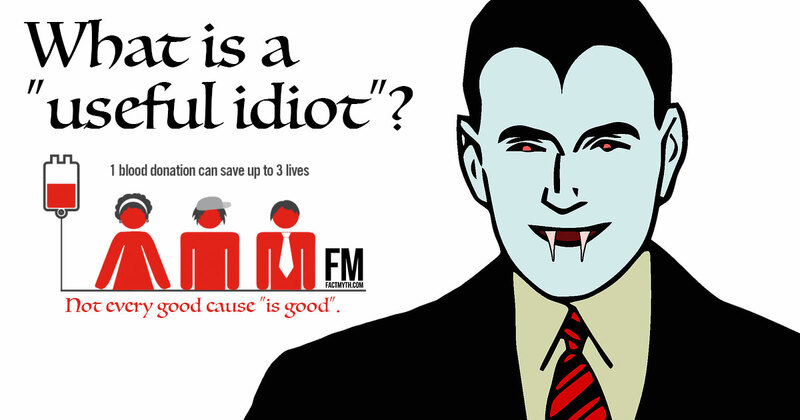 Read about why giving blood is important (<— not propaganda). This terms useful idiot is thought to originate from Soviet Russia, where the term was used [supposedly, but unlikely] by Vladimir Lenin to describe Communist sympathizers who, thinking they were ushering in an age of utopia, were actually just furthering the agenda of despots and oligarchs. Another way to phrase this is, “a useful idiot describes westerners duped into saying good things about bad regimes, especially intellectuals and stars, who innocently enough think they are standing up for world peace, but are actually just being apologists for brutal despots”. This is the way in which Ex-KGB Yuri Bezmenov (who defected to the west) explains the term. TIP: You aren’t going to assume that every feminist is a useful idiot just because I’m sharing a YouTube video with you right? We have to remember this page is about the complex things. Obviously a push toward the equality of the sexes is generally a good thing, right? That being true even when it is used against a person. That is a vital point to get. Useful Idiots. “Feminists and other leftists are useful idiots who serve only to destabilize the society. When the goal is reached, they will be ‘lined up against the wall’.” [because they are the most likely to turn once they realize they have been duped] – A clip from a 1984 interview with a former KGB agent and Soviet diplomat, Yuri Bezmenov. See his full lecture below (and keep in mind there is always a chance that some of what he says is itself “doublespeak”). TIP: It seems a little convenient that Lenin himself came up with this term (as in, I doubt this is true from my research although I didn’t prove anything conclusively). Instead, it is likely the term was simply added to the lexicon over the Communist scare in the 40’s under Stalin. Consider, Mises’ Planned Chaos came out in 1961 and early English mentions start in 1948 in a June issue of New York Times (if you know of earlier instances comment below). See instances of the term being used throughout history. TIP: The term “useful idiot” can mean just what it sounds like, or the concept can be applied as a form of doublespeak. For instance, a person stands for the right cause, which is opposite of mine, so I convince them they are a useful idiot, and then pivot them to my side. Now they are actually being a useful idiot for me. A lot of influence is based on doublespeak, accusing the other person of what you are doing, and general manipulation tactics like this (see “the bed of nails principle” for example). They work frustratingly well, and you should generally be on guard. Read more from Rational Wiki and regular Wiki. 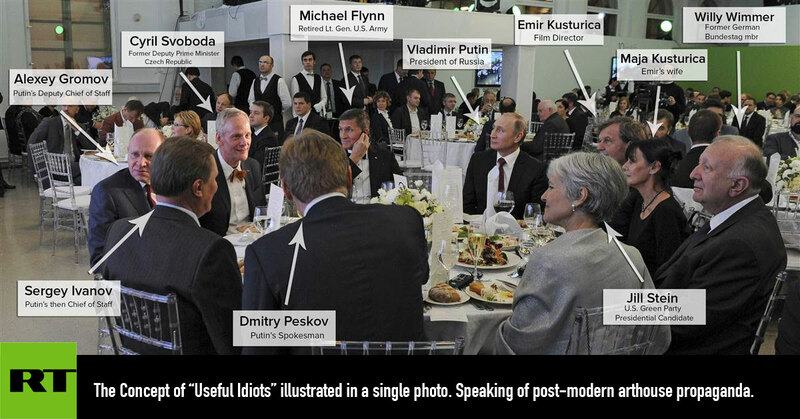 The term useful idiot is meant to be cynical and derogatory, and is typically used by “those in the know” (those who know the actual agenda of a said group). A more polite version of the term is “useful innocents”, which describes well-intentioned, but, “confused and misguided sympathizers” (according to Mises). Are Only Progressives and Liberals Useful Idiots? Does the Term Useful Idiot Apply Only to Politics? Although the term is commonly meant to slander liberals pushing a socialist agenda in the west, nothing about the concept implies that it can only be used against “the left” or sympathizers of utopian equality and social justice. Yes, the left tends to be more empathetic and trusting and thus they are easier targets (if the far-right McCarthyists hate Communism it can’t be that bad, right? No, not right well-intentioned Hollywood starlet…), but far-right anti-America rhetoric can be cited as a right-wing version of useful idiocy just as easily as far-left ideology can (for example the American-right’s obsession with Putin, shirtless, riding a horse… even Putin himself doesn’t condone doing another country’s job for them). American society values individualism and freedom of speech and that, paired with our sometimes divisive political duopoly, leaves a big opening for people running their mouths against the best intentions of the nation. For example, the 2016 election cycle was a non-stop name-drop-fest of China and Russia, claims of Fake News and Hacks (here is a “meta” example), and slanted talking points aimed at playing up one party or candidate and beating down another (“basement dwelling Bernie bros”, “baskets of deplorables”, “emails”, and “Trump steaks” oh my). As bad as me pointing that out may be (I am not “unaware” of that, although we can see that in and of itself doesn’t prevent useful idiocy), it being done in the first place can easily be shown to be worse, and this is where the rabbit hole comes in (a rabbit hole I will attempt not to enter further here). The specifics above aside, the truism surrounding the argument clearly show that useful idiots appear on both the far-right and the far-left, and even the center left and right (and not just in politics). Even something mundane, like a marketing campaign, can create useful idiots for a brand (like people who only use Apple or only play Xbox, and decry the competition, for instance). If you think, ONLY “the left” can be useful idiots, and not “the right” then, you may want to do some soul searching. Henry Ford was a useful idiot for the Nazis when he printed off the The Dearborn Independent (an “anti-immigrant, anti-labor, anti-liquor, and anti-Semitic newspaper that helped influence Hitler”). The feminists in Russia were useful idiots for those who used their progressivism as a billboard for a totalitarian agenda. Some would claim that the anti-Civil Rights activists in the 60’s, and the Civil Rights supporters themselves, acted as useful idiots for the expansion of government programs. It is unsettling to look at Civil Rights and feminism, or even the industrialist Ford, in this light, but of course, this is why the underlying tactics are so effective! I would love to leave out all the important examples, and aim to create a lovely PC page, but that seems fairly counterproductive. Better we all understand the complex tactics used to manipulate public opinion on the international stage! These are only a few simple examples of a much larger issue. The world is complex, and dissecting the art of politics and influence requires critical thinking. TIP: Suffice to say, the term useful idiot applies to all ideologies, and broadly applies to any person toeing any line thus making themselves “useful”. Certainly the general concept as it can be understood broadly is not limited just to westerners who sympathize with foreign socialists. TIP: See a breakdown of the left-right political spectrum for a better understand of the terms “left” and “right”. The concept of the useful idiot is a slippery slope because the tactic is one of using altruistic and good intentions against people. We have to both understand what is right in our thinking and what is wrong in our thinking, and then react and calibrate based on our own insight. We have to keep a clear head, be able to separate smart ideology from strategy, and see our role in the bigger picture. Keeping a clear head can be hard with emotions, social circles, personal ideologies, outside pressures, divisive politics, and talking points bombarding us all the time. Luckily, we have a pretty effective set of hardwired change, resistance, and adaptation tools. If you listen to the talking point of the day on a news station, go out and spout that talking point to a friend, and don’t know the real goal behind the point, you are being a useful idiot. The more influential you are, the more this concept matters. We are all useful idiots at times, and that does not matter much when it comes to video games or agendas that are actually good, but it can be dangerous when it comes to authoritarian demagogues on either side of the isle. TIP: People aren’t “good” or “bad” they are more complex than that. Just because you see a video that makes North Korea look good and the U.S. look bad does not make it so. There is a giant global propaganda war and there has been for a long time, our two party culture might make things complicated (as no one flames blue team and red team better than blue team and team themselves), but it is still the responsibility of the individual to not be a mouthpiece for despots of any sort. 10 Extreme Examples of Propaganda. Propaganda sometimes just looks like marketing, and so what if I run around saying “Mario is better than Luigi”… the danger is when things “get dark” like they did during WWII. It is the slippery slopes that we want to watch out for. TIP: A good first step to avoiding being a useful idiot is checking your bias without overcorrecting your bias (our whole neurology is essentially a system of hardwired and softwired bias). A favorite tactic of authoritarians who use left-leaning propaganda is to make all dissent, “a bias that needs fixing”. This is where the politically correct debate comes in. In short, bias is real and not good or bad, and correcting one’s bias can actually be a good thing. However, when the state tries to overcorrect bias in an authoritarian way, we start down a slippery slope. When a state tries to enforce bias, then we get the worst of all, “the far-right totalitarian state”. Being a useful and spreading ideology you believe in is admirable, arguably your duty as a citizen of a free country, and actually with the advent of social media, rather unavoidable. It isn’t propaganda, opinion, or ideology that is bad, and it isn’t politically correct, bias, or a specific political philosophy that is bad. It is the spreading far-right or far-left propaganda that you can’t back up with a logic that divides people and plays into the hands of those who wish us harm that is bad. The easiest way to spot dangerous ideology is that it is almost always extreme, hateful, and divisive (sometimes extremists are right, but barely ever, being extreme is different than being passionate). Yuri Bezmenov (former kgb) Psychological Warfare Subversion & Control of Western Society – Complete. Former KGB agent and Soviet diplomat, Yuri Bezmenov explaining psychological warfare and how not to be a useful idiot. Please understand his frame is one of seeing the authoritarians use the left to create a totalitarian left. So, and this is the same for many Russian intellectuals who study social psychology, he tends to downplay the equal and opposite dangers of the far-right. Read more about the left and right. TIP: Concepts like “useful idiot” aren’t about “left versus right” (as that division only serves to benefit “someone who isn’t us”), they are about recognizing the true character of ourselves and our political opposition so we can ensure truth, justice, and democracy for the next generation. Only useful idiots deal in absolutes (that and the Sith, and the Jedi when they judge the Sith, and me when I’m quoting the Jedi). The world is complex, but that is where critical thinking comes in. Is Trump Russia’s Useful Idiot, or Has He Been Irreparably Compromised? That’s the question that needs answering. Everything else is a distraction. Excellent article over all, great points until you get to the list of examples of extremist view points which is comically extremely biased. I guess it’s appropriate as a perfect example of a useful idiot. Yeah, I have considered taking that out. It is meant as an example, and I tried to present biases from both sides of the isle, but i’m sure my own bias is showing in that one a bit. I’ll consider revising or removing, but glad it didn’t detract from the more sober and centered points made above. From it’s inception the term “useful idiots” has in fact been an accurate derogatory political reference to Leftists, primarily communist sympathizers & apologists, but also includes socialists of any flavor (fascists, national socialists, Democratic socialists – all ideologies from the left end of the political spectrum, despite Google’s revisionist history). It is not at all new or uncommon for Leftists to hijack terms and turn them upside down for their own purposes & propaganda. You are 100% correct that this term originates as slander against leftists (pretty sure we cover that clearly above). However, if you understand the concept of this propaganda term meant to insult the left and thus sow division, you also understand that anyone can be a useful idiot for any cause (which we also cover above). This idea that a right-winger can’t be a useful idiot is dangerous in my opinion. How could it be that one type of human is subject to a fault like this but another never is? I mean, Fox News featuring Putin shirtless on a horse and denying the idea that Russia could have had anything to do with the propaganda campaign from the 2016 election is one strong example (as it involves the right and Russia from whence the term is said to originate)… but its hardly the only example. Cognitive bias is not our friend, we need to understand that useful idiocy is something all humans are prone to.